Though replete with luxury and comfort, Jack�s Camp is not a bush hotel. In both its atmosphere and decoration it holds true to the old-fashioned glamour of the safaris of the 1920s, reflecting a classic sense of style that is romantic, bohemian, suffused with history and sufficiently robust to stand up to the savage beauty of what lies beyond the tent flaps. Named after the legendary big game hunter and safari operator Jack Bousfield and founded by his son Ralph together with partner Catherine Raphaely, Jack�s Camp is the flagship of the couple�s Uncharted Africa Safari Co and resonates with the spirit of five generations of pioneers, adventurers, hunters and conservationists. 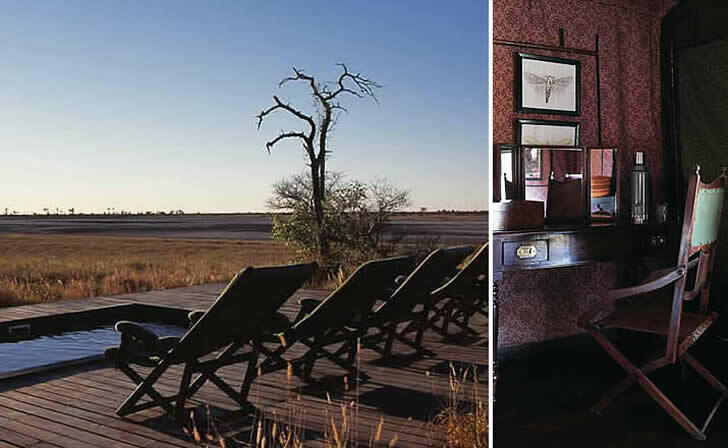 Just as remarkable as the provenance of Jack�s Camp is its location � Botswana�s untouched Makgadikgadi pans in the Kalahari desert. In parts of this forbiddingly dry environment the rains fall so infrequently that any paths made by man off the beaten track may last for years. And yet life in all its forms thrives here, from proud baobabs and thorny acacias to desert creatures such as aardvark, gemsbok, the elusive brown hyena and motley crews of meerkat. During the wet season certain regions of the landscape are transformed, their lush and watery grasslands luring flamingo, migratory herds of zebra and wildebeest � and the predators that hunt them. 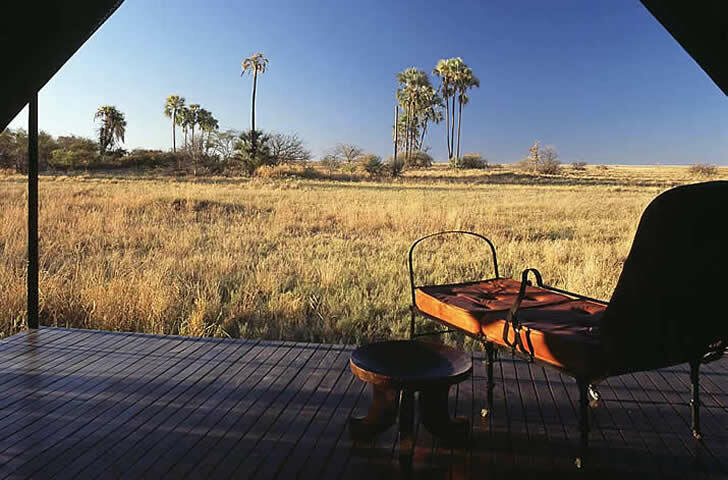 There are still many parallels between the rough-and-ready camp established by the late Jack Bousfield in the Makgadikgadi in the 1960s and Jack�s Camp in its current incarnation as one of the world�s most highly praised high-end bush destinations. 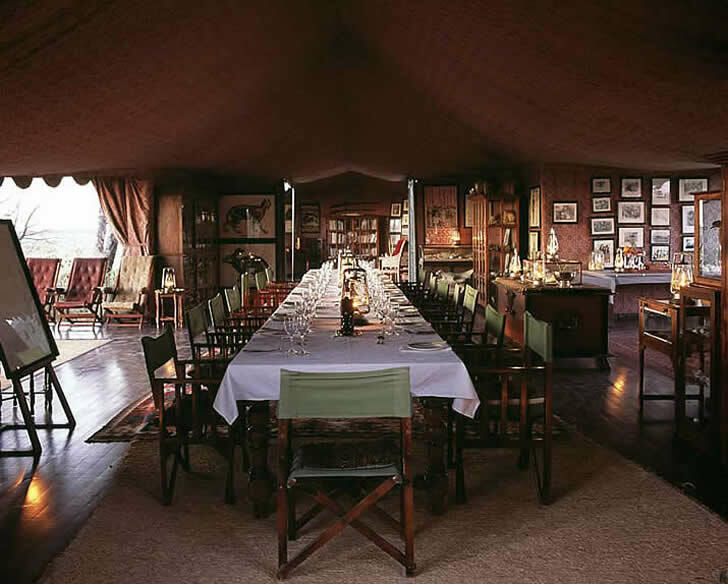 The underlying notion that a tented safari should be an experience that brings one closer to the basic pleasures of the wild continues to inform all of Ralph Bousfield and Catherine Raphaely�s decisions in their running of the camp. Lanterns, fires and stars are still the only sources of light when night falls. Wet kikois instead of generator-run air conditioners cool you down. Rinsing off can still be done under the heavens, though there�s plenty of hot water to help take the chill off. And Jack Bousfield�s legend still looms large as guests are regaled with stories of his adventures and faced with his leonine image in groupings of black-and-white photographs. Catherine Raphaely brings her stylist�s eye and unerring attention to detail into play at all of Uncharted Africa�s camps and here she has crafted an authentic African colonial interior with all its inherent elegance. Campaign furniture, wooden military chests, dark hardwood four-poster beds, Persian rugs, polished brass objects and other period pieces (most of them family heirlooms, some recreated by her talented pool of artisans) lay the functional foundations for a panoply of rich colours and sumptuous textures. 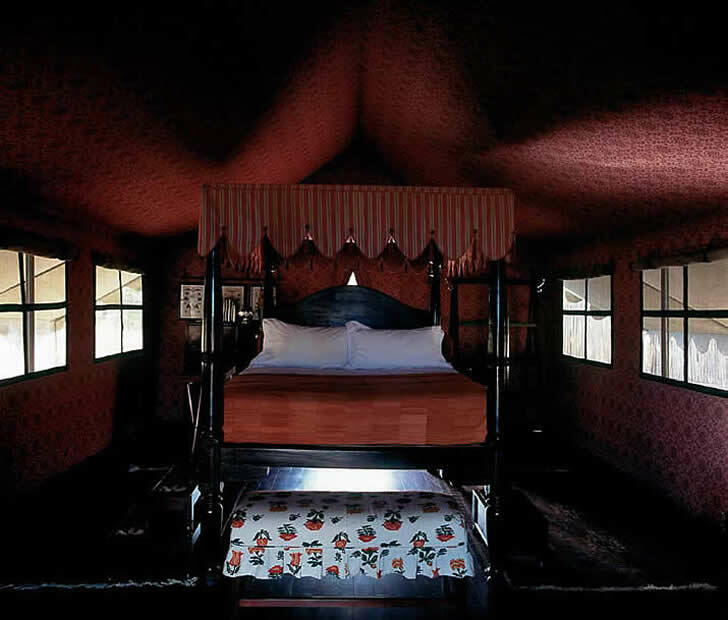 Red velvet, Anglo-Indian and North African textiles, ticking stripes, zebra and springbok hides, crisp cotton and cracked leather in combination with the furniture serve to imbue the tents (there are 10 in all) and public spaces with a sense of stately sophistication. Catherine Raphaely�s inimitably refined touch also extends to the walls and ceilings of the canvas tents, which have been lined with a Victorian- inspired fabric wallpaper � the result of a design collaboration between herself and two of her �very whimsical friends�. Like his father, Ralph Bousfield is a pioneering naturalist whose interests extend beyond flora and fauna to archaeology, paleoanthropology, geology and the culture of the local Bushmen. A happy consequence of decades of hunting and gathering is that Jack�s Camp is like a gigantic cabinet of curiosities: botanical, insect and wildlife drawings, photographs and etchings as well as extensive family collections of antique maps, bones and skulls, fossils, taxidermied animals, beadwork, and prehistoric tools have been curated by Catherine Raphaely and displayed in fascinating installations. Here, tradition and eccentricity are flawlessly united in an atmosphere that really is without equal. 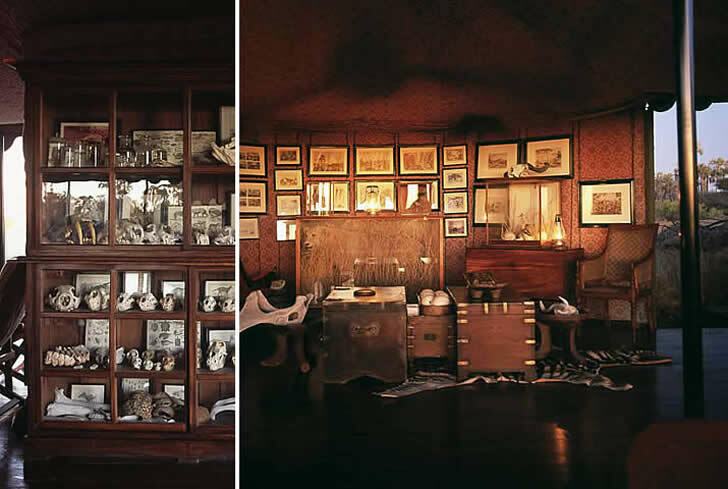 �As well as our position in this extraordinary natural environment, Jack�s is so layered and has so many years of collections, heirlooms, bespoke pieces and items given to us by friends and guests that it would be impossible to recreate or imitate, even for me,� says Catherine. And while he was not one to concern himself with frivolous discussions of aesthetics or decoration, one can imagine Jack�s gnarled countenance looking down and smiling in approval at the authentic character of this splendid camp, which continues to honour his legacy.